Having fine hair means you have to take extra special care of it. People get fine hair for a variety of reasons. Some may be born with it, others may experience it from years of hair abuse, even some medical conditions can cause you to have fine hair. Whatever the reason may be, I am going to share five tips for helping you care for your beautiful tresses. A diet rich in iron and biotin is essential for people with fine hair. Foods like kale, beans and spinach are not only rich in iron, but also contain biotin which can help to support healthy hair growth. Other foods that are great for the hair are protein rich foods like nuts, eggs, whole grains. The healthier you eat, the more your hair and body will reward you. Don't forget about water intake. Your body loves water and so does you hair. The shampoos, conditioners and products that you use on your hair are important. You should be looking for products that provide nourishing moisture to you hair. 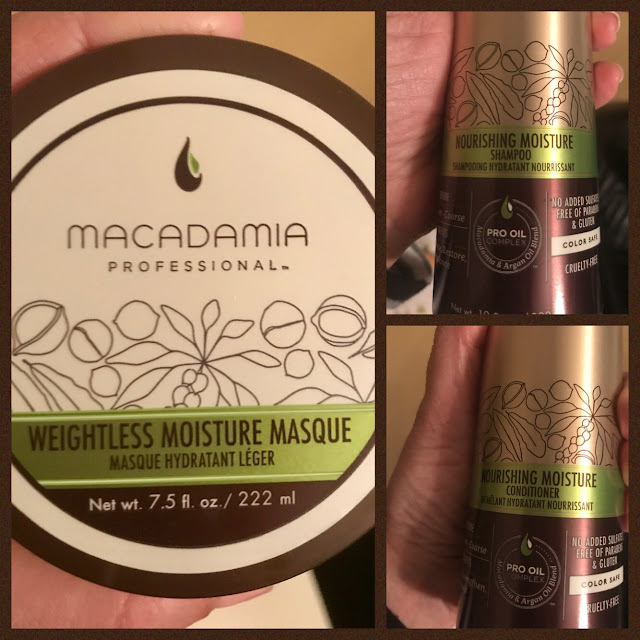 Products like these Macadamia Professional Nourishing Moisture line are made to re-hydrate, strengthen and balance hair. They smell pretty too. When you have fine hair, you shouldn't be roughly towel drying your hair. Instead, gently blot your hair to remove excess moisture. This will help cut down on frizz and tangles. Also, it will make drying it easier too. Try parting your hair in the opposite direction, or if you part your hair in the middle, try parting it to the side. This can add the look of volume to your hair. Play with different styles. If you like to wear pony tails, look for hair accessories that are specially made not to tangle or grab your hair. The last thing you want to do is lose hair. You may even want to speak to your hair dresser about getting a volumizing haircut. Light layers can make a big difference in the appearance of volume in your hair. Picking the perfect hairbrush is important when you have fine hair. Avoid round metal brushes that contract heat and can damage your hair even more when drying. You also want to avoid hard plastic bristles because they tend to cause breakage because they snag at fine hair. Instead, opt for a natural brush made of boar bristles or flexible nylon. They will be easier on your hair and glide easier through it. If you have a good brush, feel free to give it a few brushes at night to give it a lustrous shine. I hope these tips will help your fine hair looking more beautiful. Disclosure: This is a sponsored ad. We are a professional review site that receives products or compensation from the companies whose products we review or advertise. We test each product that we review thoroughly and give high marks to only the very best. We are independently owned and the opinions expressed here are our own. Your opinion may differ.